AG Doll Adventures – Dolls, Adventures, and much much more! Dolls, Adventures, and much much more! We are starting a photo series! This is a collab with The Director, who helped me with the story, doll positioning, and lighting. She also let me borrow Molly for the story! Skylar walked over to the dilapidated sink. After washing a few dishes, it was literally falling apart. “Uh oh,” Skylar muttered. Molly had made the kitchen by hand, and wouldn’t be too happy when she saw what had happened. Skylar heard footsteps in the hall. The door creaked open. It was molly! “What happened to my kitchen!” Molly said. “It fell apart,” Skylar said slowly. “It’s ok,” Molly said. “Julie and I ordered a new one, and it’s coming tomorrow. It was supposed to be a surprise but now,” She looked at the sink. “Let’s move it out,” Skylar suggested. A note lay tucked under the cabinet. No one had found it before. They began to move it to the garage. But then Skylar noticed the note. She reached down and picked it up. “Wow!” she said excitedly. “Look at this!” The ran over to the table to investigate the strange, wrinkled piece of paper. “What is it?” Molly said. She was always excited for an adventure. Skylar looked up, “It’s a map or a clue,” She began to read the note aloud. “Under the house, you will find… then there is some kind of map,” Skylar thought for a moment. She read the sentence again to herself, while Molly took a sip of water. “Well the only thing under the house is the basement,” Molly said logically. So they set off down the stairs and on to an adventure that neither could have dreamed of. What do you think? Would you like to see the next part? Hi everyone! I started another blog!!!!!!! I’m so excited to share it with you! My new blog is A Sapphire’s Stardust! It is mainly a photography blog, but I will sometimes post writing or reading posts! A couple days ago Julie took me on a walk to the Netherlands Carillon which is near the Arlington Cemetery. It has an amazing view of the National Mall! The sun was almost about to set, so the lighting was perfect! What a walk! I can’t wait to see it in the spring when the grass is green! Today, I took Julie’s Husky, Pepper, on a walk. He’s so cute! Even though it’s winter, there’s no snow. I think Pepper wishes there were snow because Julie says he loves pulling the dogsled. Pepper is so obedient, I didn’t have to put him on a leash! He always stays pretty close! The weather was in the fifties so I didn’t have to bundle up! I like warmer weather. I hope you enjoyed the photoshoot! Step 2: Take clay and roll it into balls. The size of the balls determines your leaf size because this ball will end up as a leaf. Step 3: Flatten the balls and pinch one end into a point. Step 4: Make a lot of these! Repeat steps two through three. Step 5: Make a base. This means take a few leaves and put the blunt ends together. Step 6: Make a layer of leaves on top of the base layer. Step 7: Make a layer on top of this. This is your final layer of leaves. Step 8: Brush chalk pastel dust against the tips of the leaves. The plant part is done! Step 1: Roll out a white ball of polymer clay, then push your them in gently. Make sure that is is about as wide as the plant. Step 2: Put the plant on top! And your plant is done!!! What do you think? If you do the DIY, send me a few photos and I’ll be happy to post them! Hi Everyone!!! Happy new year!!!!!! I can’t believe it’s 2018!!!! We have lots of food from my store, The Miniature Cafe, like these yummy donuts! The photographer made these little plants! She’ll be posting a DIY on how to make them soon! Don’t you think the kitchen is really cute? I LOVE IT!!!!!! The shoes from the Truly Me outfit work really well with the outfit because they have a little pink in them! I’m working on her bio! It’ll hopefully be finished by Jan 1! 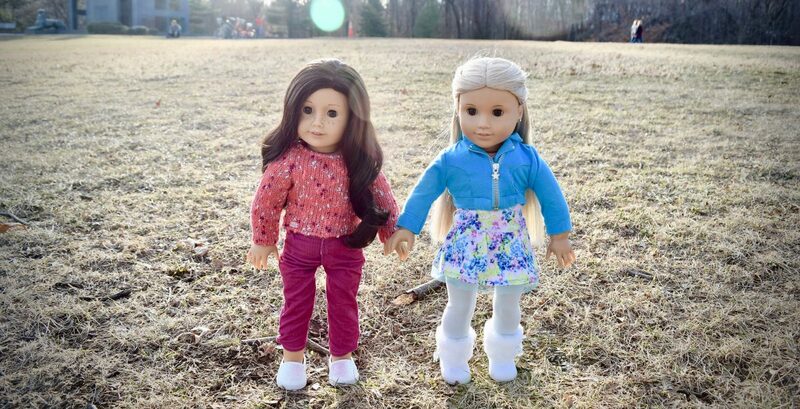 Did you get an AG Doll for Christmas? Or any AG clothes? Welcome to the AG Doll Adventures Blog! Adventures are posted every day that are funny and exciting! AG Doll Adventures Create a free website or blog at WordPress.com.